Lion Lamb Blog -- David Mundy: Blasphemous? When was the last time you heard anyone in our culture speak about blasphemy? We live in an OMG age where nothing seems to be sacred, so how could anything be considered blasphemous? Granted, we probably have our own thresholds for the blasphemous -- I hate it when the Hallelujah Chorus is used glibly to advertise a product or the new hosts of a radio show. But it doesn't occur to me that criminal charges might be laid. 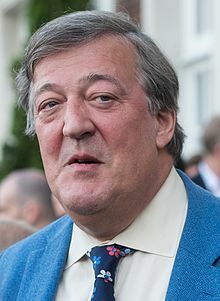 Stephen Fry is a British actor and comedian and activist who is currently under investigation by Irish police for what might be blasphemous talk, and a violation of long-standing Irish laws. Fry appeared on a show named The Meaning of Life, in February 2015, and he was asked what he might say to God at the gates of heaven. Fry's response was: "How dare you create a world in which there is such misery? It's not our fault? It's not right. It's utterly, utterly evil. Why should I respect a capricious, mean-minded, stupid god who creates a world which is so full of injustice and pain?" He went on to say that Greek gods "didn't present themselves as being all seeing, all wise, all beneficent", adding "the god who created this universe, if it was created by god, is quite clearly a maniac, an utter maniac, totally selfish". That's straight talk to be sure, but if we're honest, who hasn't shared these thoughts as we've experienced or witnessed the unfairness and suffering in this world. While we hope we won't stay here, we all want to know where God when tragedy and loss strikes. By all accounts Fry is a good, kind, and compassionate person. I may not agree with him in the end, I can't imagine that any useful purpose will be served by charging him with the crime of blasphemy. i would say he was not blaspheming - just questioning.... but I would also tell him it is not God who makes things go wrong - it is we humans ! Agreed Judy. There are far greater blasphemies in my estimation, such as electing a leader who is believer in sheep's clothing, with the support of supposed religious leaders.